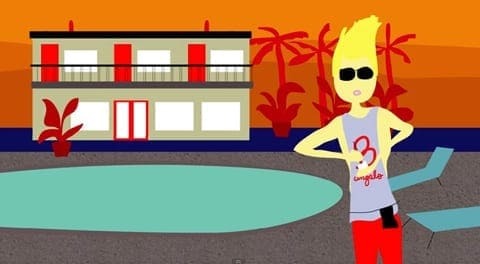 Written by Nate Clark & Allen Loeb, new animated web series Somewhere In Palm Springs is about three gay friends and their gal pal hanging by the pool in Palm Springs, California. The series stars Drew Tarver (How I Met Your Dad) and Jimmy Fowlie (Go Go Boy Interrupted) and premiered June 24. 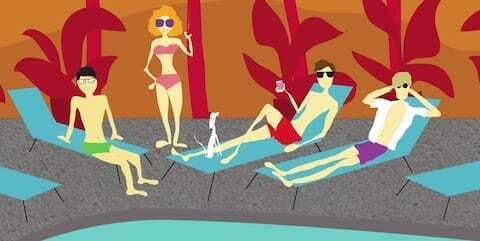 Life is hard when you're young, dumb and hungry…poolside in Palm Springs, California. Somewhere In Palm Springs is the harrowing tale of 4 friends forced to wait a normal amount of time for their lunch to arrive to their lounge chairs — they share hopes, dreams, neuroses, and the sordid details of their various one night stands. They may be vapid, but, hey, at least they're vapid.